Expedition 37 Flight Engineers Oleg Kotov and Sergey Ryazanskiy have concluded their EVA-36 spacewalk, which opened with the unique event of conducting an Olympic torch relay on the outside of the International Space Station (ISS). The two cosmonauts then enjoyed mixed success with their main EVA tasks. Saturday’s EVA was conducted by Kotov – as EV-1 and Ryazanskiy – as EV-2. 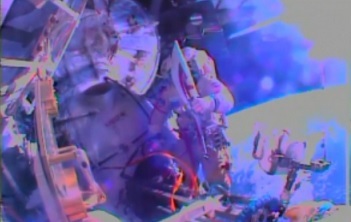 The spacewalk began when the duo departed from the Pirs docking compartment airlock at 2:34pm UTC. While normal spacewalks would open with the staging of equipment and the securing of tethers ahead of their set tasks for the job in hand, this EVA began with a publicity stunt for the upcoming winter Olympics. The 2014 Winter Olympics – the 22nd Winter Games – will be held between the 7th and 23rd February, 2014 in the Russian city of Sochi, marking the first Olympic Games to be held in the Russian Federation, following on from the 1980 Summer Olympics, which were held in Moscow during the era of the Soviet Union. Given Russia’s wish to use the games to project a positive image of the country, in direct competition to continuing international concerns over domestic civil liberties and foreign policy, President Putin has personally involved himself in the propaganda drive for what are the most expensive winter games in history. 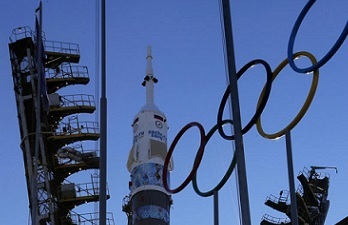 With the Olympic torch on its relay tour, the current leg involved it being stowed on Soyuz TMA-11M, for a ride up to the International Space Station. With the Soyuz FG carrier rocket prettily decked out in the Sochi Olympic colors, veteran Russian cosmonaut Mikhail Tyurin, NASA astronaut Rick Mastracchio and JAXA’s Koichi Wakata successfully launched en route for another fast rendezvous with the orbital outpost, arriving for docking just over six hours after lift-off from the Baikonur Cosmodrome. With the Soyuz TMA-11M successfully docked, the hatches were opened to allow Tyurin to lead his crew into the ISS, holding the Olympic torch as he floated into the Station. The arrival marked a rare occurrence where the Station’s crew compliment was increased to nine people. 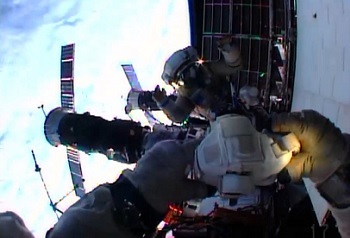 The EVA itself will begin with the Russian duo taking the torch outside of the airlock for photo opportunities. After around two hours of shuffling around the outside of the Station, the torch was stowed back inside the airlock, allowing the spacewalkers to get to work on installing a foot restraint on a the nearby worksite and removing a handrail on the Zvezda VRM EVA workstation. Working around the Service Module, Kotov and Ryazanski worked on cables at the RK21 site before attempting to fold up the panels on the hardware into its original configuration. The EVA tasks were mainly related to the preparations on the Urthecast pointing platform for installation of the HD camera in December. However, only the removal of the launch restraint from VRM EVA workstation and the disconnection of the RK-21 experiment were completed. The duo struggled with the relocation of the Yakor foot restraint – which they opted to take back to the airlock instead – while also failing to fold and lock RK-21 experiment antenna panels. While the spacewalkers managed to take a large quantity of photos for engineers on the ground to examine, the spacewalk was concluded after the failure to fold up the RK-21 panels, resulting in outstanding tasks for the next EVA. However, the mainstream media had already classed the spacewalk as a success, given their attention span was solely on the torch relay. The EVA came to a close after five hours and 50 minutes. Meanwhile, the Station will return to six crew members when the four day direct handover is complete, marked by the upcoming departure of Karen Nyberg, Luca Parmitano and Commander Fyodor Yurchikhin, with the trio set to return to Earth with the Olympic torch in tow. Soyuz TMA-09M is set to undock on Sunday evening from the Zvezda service module, prior to a landing in Kazakhstan several hours, ending their space adventure that began in May. Expedition 38 officially begins and the station returns to six-member operations when Expedition 37 undocks. Kotov, a veteran cosmonaut, will command the orbital laboratory for the second time since 2009.